Halal is among the trending topics in the UK at the moment - why? A giant pizza featured on the front page of The Sun newspaper on Wednesday morning, together with the headline: "Halal secret of Pizza Express." All chicken served in the chain is halal, the paper reported - but customers are not being told, they said. 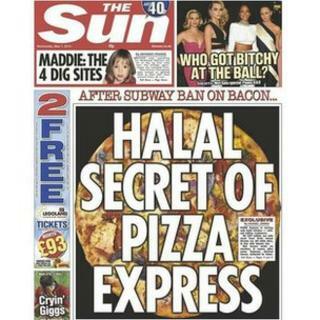 Bloggers and news outlets were quick to jump on the story, pointing out the "secret" of Pizza Express' halal meat policy was perhaps not so secret after all... It's explained in the FAQ section of the company's website, has been tweeted about by Pizza Express, and mentioned in previous news reports. Former Apprentice candidate Katie Hopkins tweeted: "Do not use the phrase 'religious friendly foods' in association with halal. About as friendly as Ebola." The discussion soon prompted a backlash hashtag - #halalhysteria. "These aren't secrets being exposed," tweeted writer and blogger Steve Rose, "more vehicles for bigotry". "This is power keg stuff," he said. Others were similarly damning. "Funny how bigots have a problem with halal meat in Subway and Pizza express but no issue with a 'dirty kebab after a night on the lash!'" tweeted Omar Ali, president of the Federation of Student Islamic Societies. "Do people upset about halal chickens in Pizza Express think regular abattoirs are like luxury health spas?" added Anita Singh from The Telegraph.